Yesterday was crappy, all in all. Overnight on Tuesday received six inches of heavy snow – the kind that really tires you out when you shovel. I did a little for my mother, but my spouse shovelled our whole driveway. That’s in excess of 100 feet! He really deserved something wholesome and hearty for dinner. It was the very least I could do for all his (very) hard work. When you’re looking for a hearty green, you should think of kale. It's a bonus that it's exceptionally healthy as well. Kale is a powerhouse, nutritionally-speaking. Kale is an amazing vegetable recognized for being exceptionally nutrient rich (with accompanying health benefits), and flavourful. It’s fairly strong so can stand up to some pretty intense dishes. Kale is a member of the Brassica (cabbage) family. It is available year round but is at its best through the winter months and into the spring. It is sweeter when in season. Actually, light frost makes the best kale. Kale’s health benefits are linked to its high concentration of the antioxidant vitamins A, C, and K, and sulphur-containing phytonutrients. 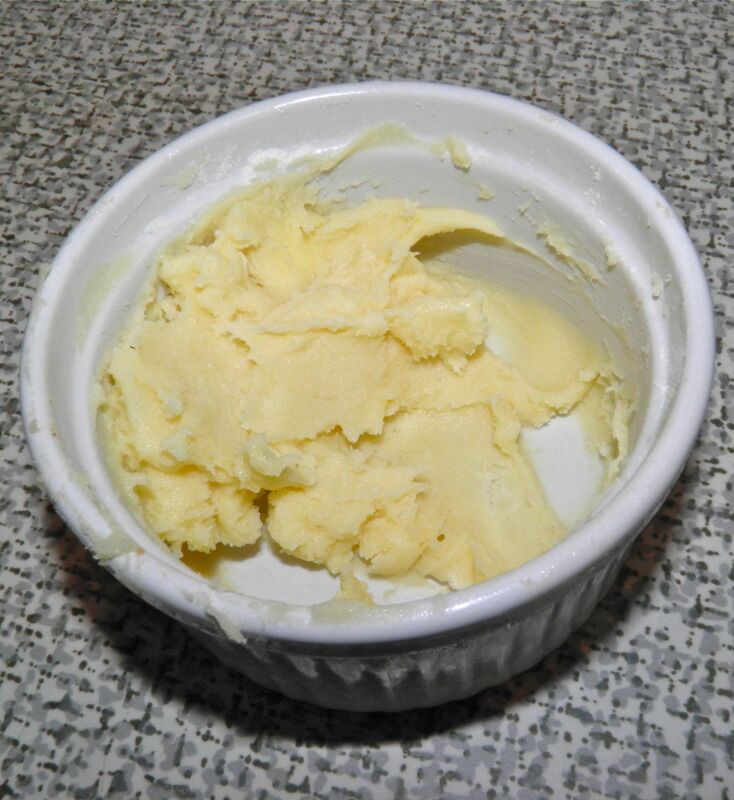 (kneaded butter and flour – no lumps! It contains carotenoids and flavonoids, are the antioxidants associated with anti-cancer health benefits. 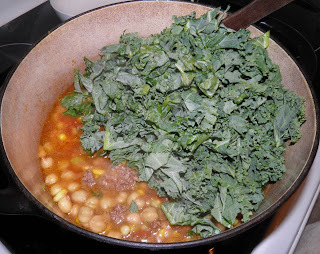 Kale is also rich in eye-health nutrients like lutein and zeaxanthin. Besides antioxidants, the fibre in kale binds bile acids thereby lowering blood cholesterol levels and reducing the risk of heart disease, especially when it is cooked. Here’s some specific nutritional info. The percentage is your daily recommended intake. This is for only 1 cup of kale. Vitamin K: 1327.6%; vitamin A: 354.1%; vitamin C: 88.8%; manganese: 27%; fiber: 10.4%; calcium: 9.3%; vitamin B6: 9%; potassium: 8.4%; iron: 6.5%; magnesium: 5.8%; vitamin E: 5.5%; omega-3 fats: 5.4%; vitamin B2: 5.2%; protein: 4.9%; vitamin B1: 4.6%; folate: 4.2%; phosphorus: 3.6%; vitamin B3: 3.2%; Calories (36): 2%. We should all eat more kale to take advantage of all its amazing benefits. The recipe I made combines several other significantly nutritious ingredients with it. Tomatoes, corn and chickpeas are three good ones. A key to eating nutritionally is to eat "colourfully." That means using vegetables of different colours, reds, oranges, greens, yellows... Different nutrients show as different colours. 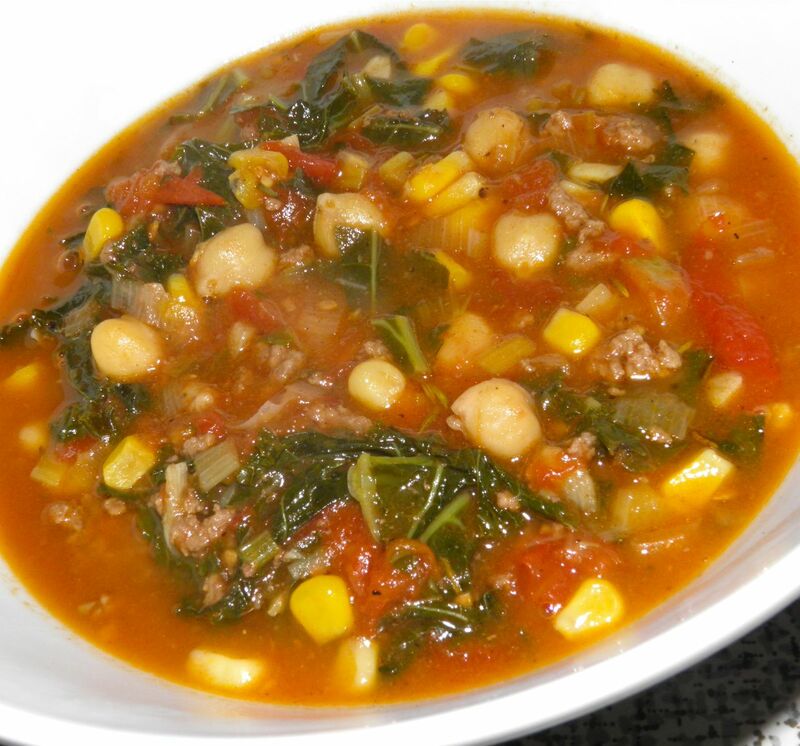 The result of this recipe is a colourful, surprisingly aromatic, deep and delicious soup with a rich, ochre broth. It’s perfect for dipping rolls or thick slices of bread! 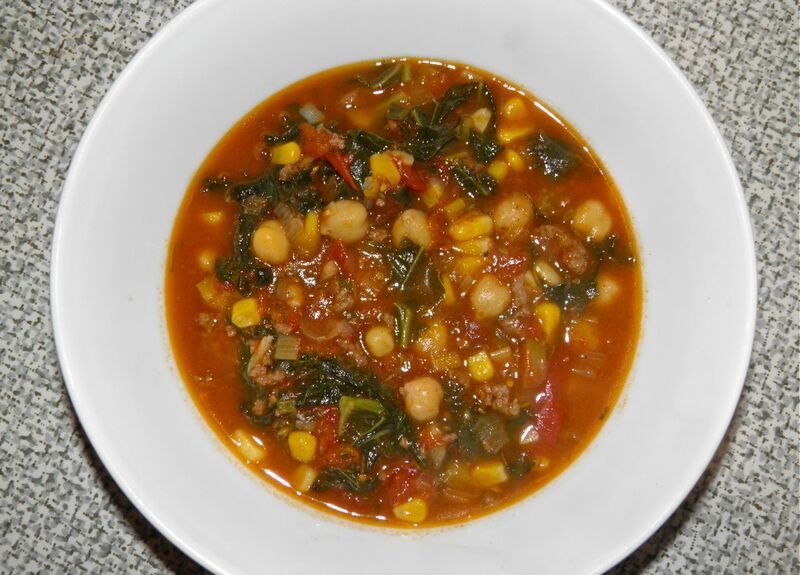 Heat the olive oil in a large pot or Dutch oven. Sauté the leeks and garlic until the leeks are softened. Then add the hamburger and cook until browned. Drain and rinse the chickpeas. Drain the corn if there is any liquid in the can. 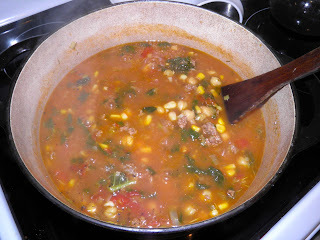 Add the tomatoes and liquid, chopped kale, chickpeas, and corn. Then add the broth, wine, paprika and rosemary. Taste and add salt and pepper as desired. Being the mixture to a simmer, cover and cook for 20 minutes. While the soup is cooking, knead together the butter and flour (buerre manie). After the 20 minutes, stir in the beurre manie and let cook until slightly thickened.